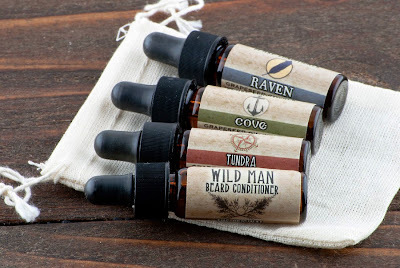 We understand that picking scents over the internet is risky, so we now offer a trial size sampler pack of our four traditional Wild Man Beard Conditioner scents! This sweet little set contains 3.7 ml // 1 dram dropper vials of The Original, Raven, Tundra and Cove in an unbleached cotton drawstring bag. That's enough for 1-2 weeks of daily use for each scent (1-2 months total use per pack) - plenty of time to pick your favorite scent! Wild Man Beard Conditioner is a highly absorbent, moisturizing and lightweight oil ideal for the daily maintenance of the skin and beard. Perfect for all skin and hair types, this oil mimics your skin's natural moisturizers, absorbs quickly, strengthens hair and leaves your beard with a subtle shine and soft feel. Our unique therapeutic grade essential oil blends naturally condition hair and act as an aromatherapy aid with a subtle, beard-appropriate scent. Each Wild Rose product is ethically crafted from the finest natural ingredients available.